When I moved to Maryland, I was blown away by seeing the flag everywhere. I’d never seen so much pride in a state flag before. And though Google Images says otherwise, this level of pride isn’t just relegated to white people. Black people in Baltimore and throughout Maryland rock the flag as a tattoo. 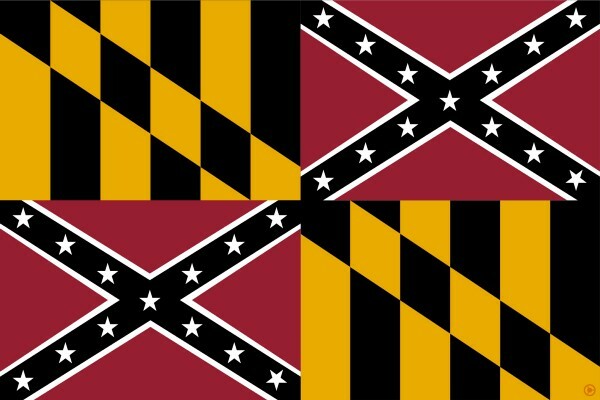 What a lot of people don’t know is that the Maryland flag is half Confederate. During the Civil War, Maryland was part of the North, despite Confederate support in a lot of areas. In fact, the first casualties of the Civil War were in Baltimore. Confederate support in Maryland was especially strong in the central, mostly white part of Baltimore and on the Eastern Shore. The Union Army of Maryland flew this flag, which is the heraldic banner of George Calvert, the first Lord Baltimore. Harriet Tubman herself played a significant role in the war, acting as a spy and military leader. 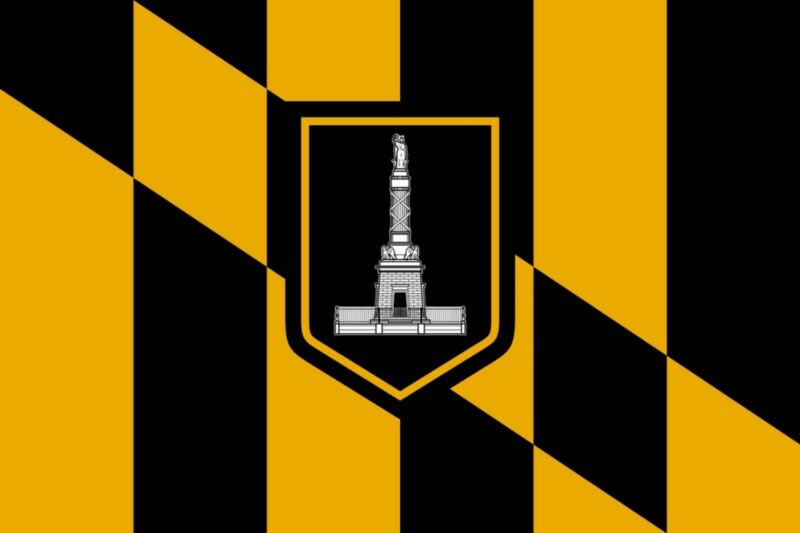 Because of this allegiance to the North, the City of Baltimore retains this design as it’s flag, with the Baltimore Battle Monument as it’s centrepiece. Many Marylanders supported the Confederacy. Maryland deep roots in resisting the North, including plots to assassinate President Abraham Lincoln and a racist state song. 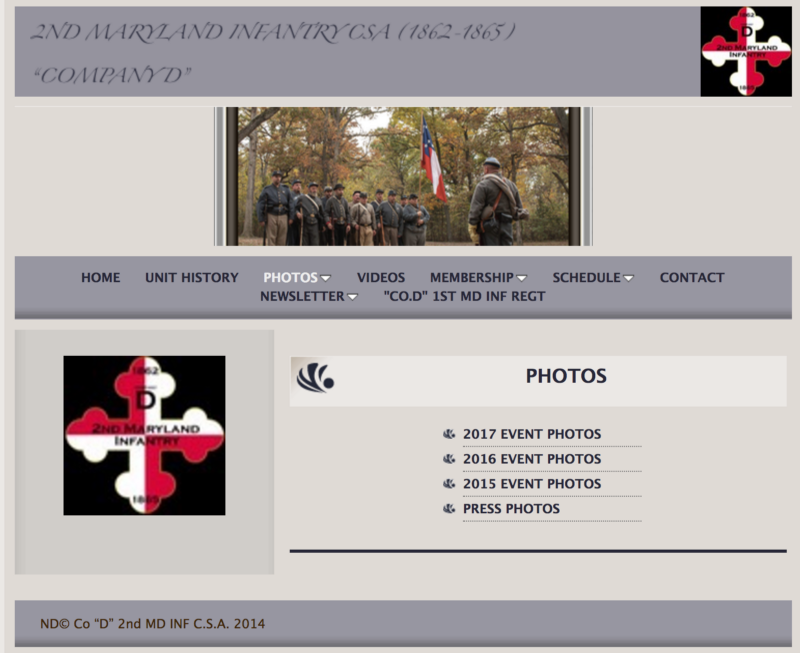 Secessionist Marylanders, many who fought alongside General Robert E. Lee, adopted the Crossland banner to identify themselves. The Crossland Banner, originally part of the 2nd Lord Baltimore’s Coat of Arms, was adopted by the Maryland confederates during the civil war. 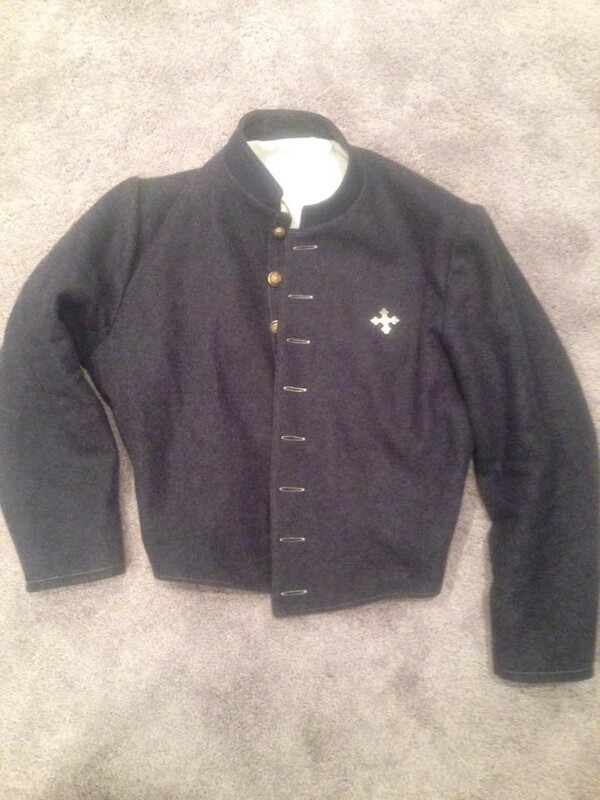 A confederate Tait jacket as worn in the 2nd Maryland Infantry sporting the Crosslands Bottany Pin. 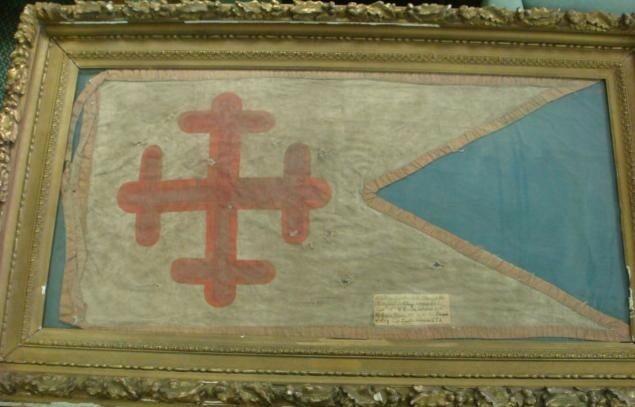 Original Swallowtail Guidon of the 4th Maryland or Chesapeake Battery, Maryland Line of the Confederate Army of Northern Virginia, featuring the Bottany Cross. Organized in 1862, also Know as Brown’s Battery after their Commander, William D. Brown of Baltimore, Maryland. The display of confederate colours became so widespread that eventually a law was passed forbidding people from displaying the colours. Anyone caught wearing the colours was arrested for treason. 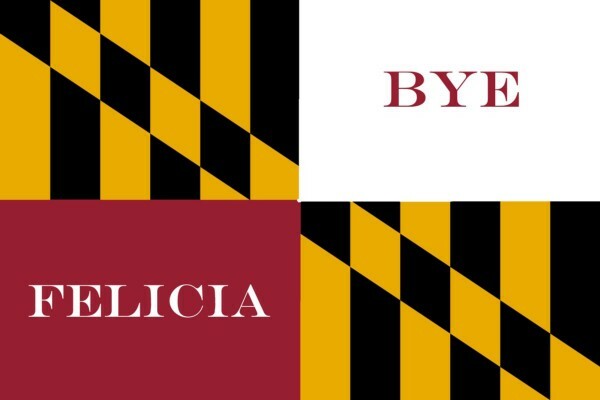 15 years after the war, Maryland tried to reconcile the two sides be combining the flags into one in October of 1880 during a parade celebrating the 150 years since the founding of Baltimore. 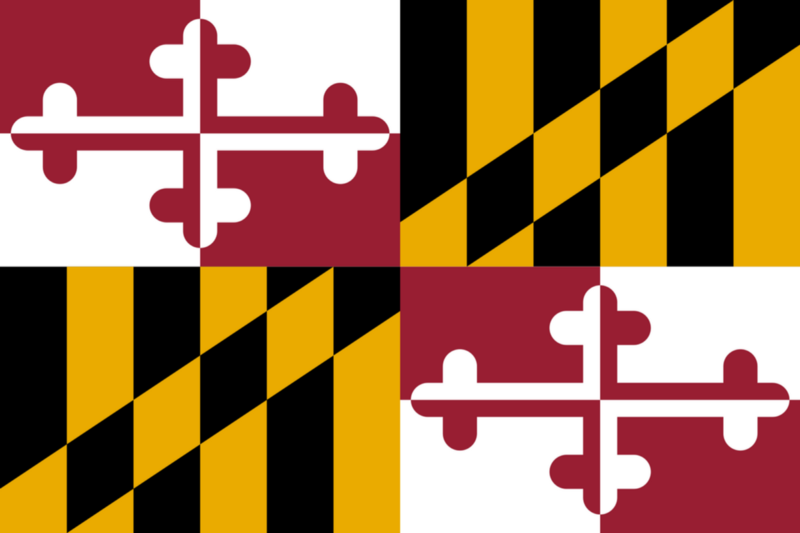 The Calvert Coat of Arms had been associated with Maryland because it was used on official documents, but the state had never had it’s own flag before this point. After the American Revolution, Maryland ceased using the Calvert Coat of Arms to identify itself. In 1904, the flag was officially adopted by the state. 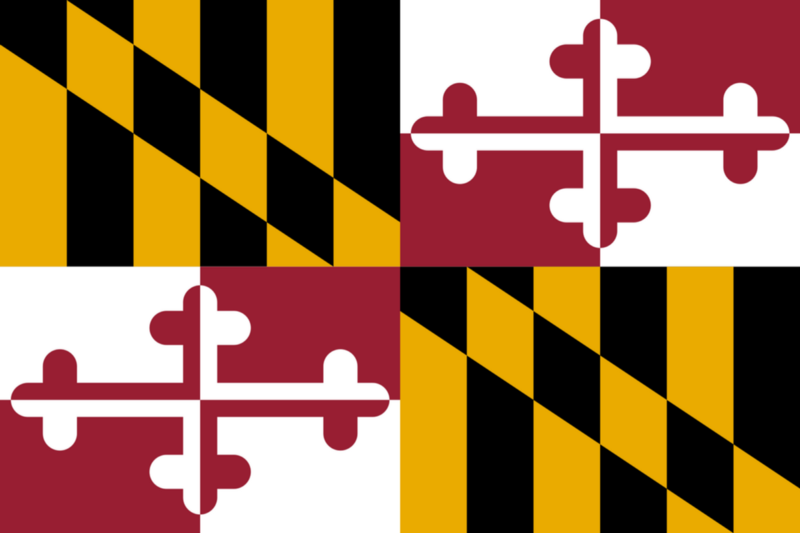 The reversed flag, originally flown as the first Banner of Maryland. However, sometimes white supremacists (which are alive and well in Maryland) will flip the flag on purpose. 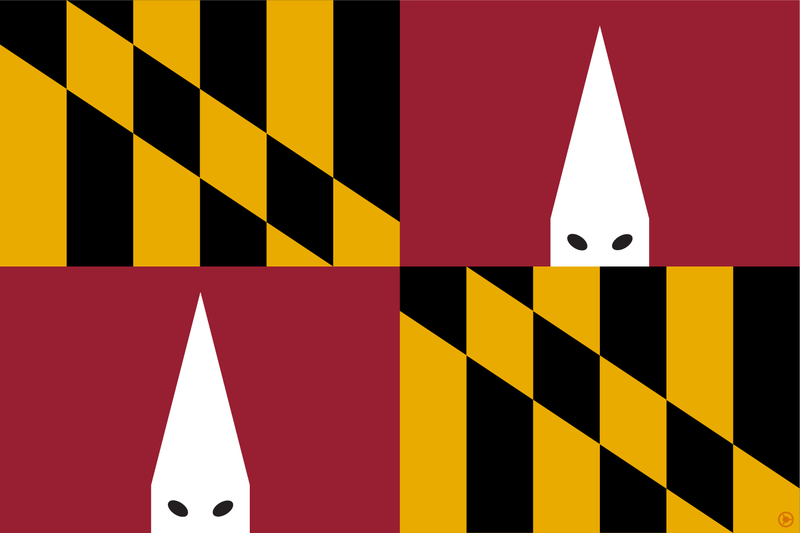 Because most Marylanders don’t know the history, the flipped flag can be used as a secret symbol of supremacy. There are some accidents, like this one on the left, where the Holiday Inn flew the flag upside down accidentally. Some places will openly fly the Crossland banner. I saw one outside of a house in Canton, a white neighbourhood in Baltimore. The wild thing is that some people think it’s patriotic, not knowing the full history of the flag. The real legacy of the Maryland flag is actually the unwillingness of white Marylanders to rid themselves completely of racism. That’s why we’ve had confederate monuments for so long. That’s why we still have a racist state song. None of this is new knowledge. Literally, all I did was repeat some facts freely available on the Maryland state website. However, because of all the attention the twitter thread I originally wrote got, several news organizations wrote articles about it. 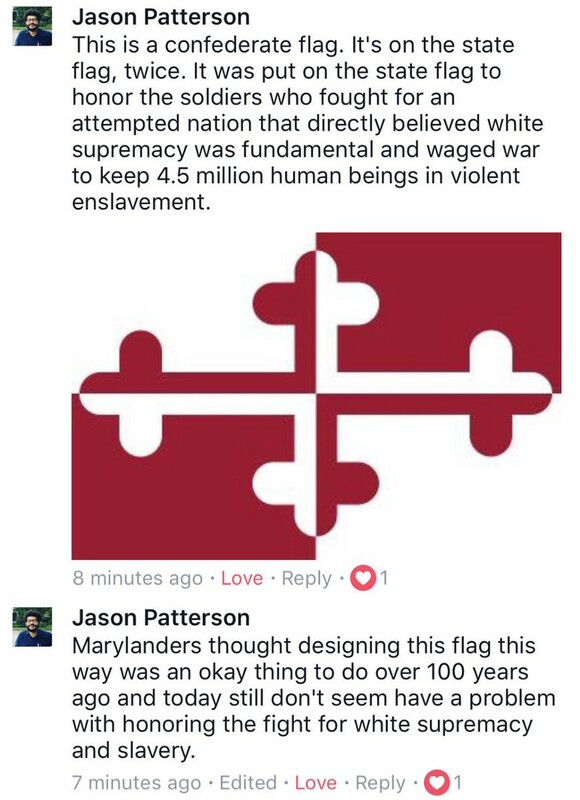 CBS Baltimore wrote “Does Maryland’s Flag Have Confederate Ties? 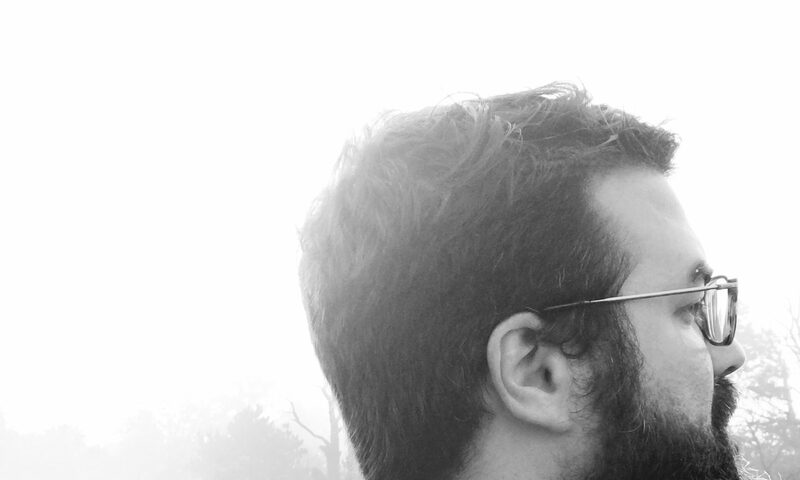 Social Media Campaign Sparks Controversy”, though they didn’t talk to myself or April Reign, the originator of the #NoConfederate campaign. The Baltimore Sun’s Christina Tkacik wrote: “Activist draws attention to Maryland flag’s Confederate ties during #NoConfederate campaign” after talking with both April and me. WUSA9’s Debra Alfarone did a video interview with me, and broadcast “Does Maryland flag have Confederate ties?” on the DC evening news. And then all hell broke loose. A Republican group called “Red Maryland” created a petition called “Save Maryland’s Flag”, stating that “Maryland’s flag is under attack”. All based on my tweets. Maryland Governor Larry Hogan had just removed the Confederate statue of Justice Roger B. Taney from the Maryland State House under the cover of darkness, which had enraged far-right Marylanders. 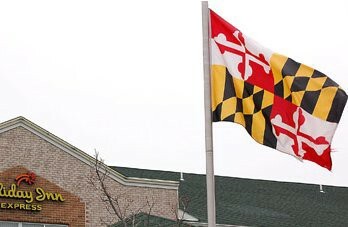 The Baltimore Sun’s Pamela Wood wrote a piece on it titled “Hogan: Don’t change Maryland’s state flag”. Fox News’ Bryna Zumer wrote “Gov. Hogan: No plans to change Maryland state flag”. Want to redesign the flag? Let’s do it. 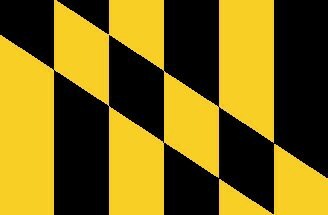 Here’s a concept for a redesign of the Maryland Flag, by me. In an attempts to garner his Republican base, Gov. Hogan posted his support to the petition to “Save the Flag”, along with the link to the petition itself. All this, to save the flag. From me, apparently. The petition by Red Maryland is an alarmist reaction by Maryland Republicans designed to rile people up based on the false idea that anyone is asking the flag to be taken down. Gov. Hogan is signal boosting this false outrage to garner his Republican base. 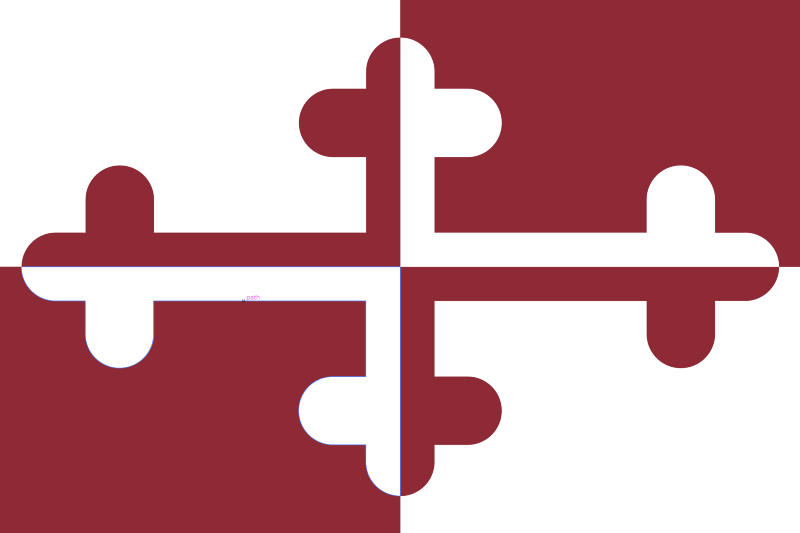 Another concept to redesign the flag, by me. Because of the reaction to Charlottesville and the removal of the Confederate monuments around Maryland, and are some people who under some impression that this means that history is being erased. I’m doing the opposite of that. I don’t want history to be erased. I want history, especially the history of white supremacy in Maryland, to be laid open and bare. After the civil war, Maryland made great attempts to reconcile with their “confederate brother” and unite the state, lest it be ripped apart. The flag was a token of that. However. Black Marylanders, who the war was fought over and whom the Confederacy affected the most, were ignored. The newly emancipated enslaved African was left waiting for a Reconstruction that never fully materialized. Black Marylanders never got a say whether or not the flag that represented them contained symbols used by a force meant to oppress them. This is based on a thread I wrote on Twitter.